Prior to installation, energy-efficient shades were used to reduce the heat and glare caused by the sun. The installation required a significant amount of planning to ensure that tenants were inconvenienced as little as possible. One Market Street, a 1.5 million square-foot building owned by Equity Office Properties Trust, sits on the San Francisco Bay waterfront. With its floor-to-ceiling windows, the building's tenants have some of the most spectacular views of the Bay area. But while the tenants never complained about the outdoor scenery, they did complain about the heat and glare caused by the sun's rays. Equity Office Properties Trust contacted several window film companies to offer solutions to the building's heat and glare problem. Paul Murphy of Special Products Window Film Company in Foster City, California, a 3M-authorized Dealer / Applicator, suggested RE20NEARL Scotchtint for the building's windows. "We chose RE20NEARL because it significantly reduces glare and increases a building's energy efficiency," says Murphy. "It also reduces the window clutter caused by blinds and shades that can be seen from the outside. Once RE20NEARL is applied, the outside of the building looks consistent, which greatly enhances its appearance." He was asked to complete the project, which took more than three months to finish. "This was by far the largest window film project ever done in the San Francisco area," Murphy recalls. "So it required a significant amount of planning to ensure that the building's tenants were inconvenienced as little as possible. We had a four-person production crew working on the project - mostly after hours." The project manager's goal was to keep the tenants happy, and while the project was service-intensive, Murphy says that not one tenant complained. And, because the window film installation increased the building's energy efficiency, Pacific Gas and Electric Company offered Equity Office Properties Trust a rebate. As a result, the company's project payback was realized just twenty-one months after installation. 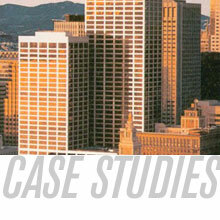 According to Murphy, Equity Office Properties Trust chose to work with Special Products Window Film because of its reputation in the Bay area and because of its exclusive use of 3M products. "They chose us because of the service they were going to receive and because they wanted the finest quality products available," Murphy says. "They knew they could get that with 3M."